This region, historically known as Bessarabia, has changed hands many times. After being Turkish (Ottoman) for many years it became Russian in 1810. In 1917 it proclaimed independence before joining Romania in 1918. In 1940, under the terms of the Molotov-Ribbentrop pact, it once more became Soviet. The territory was joined to the pre-existing Moldavian ASSR, a Soviet fiction carved out of Ukraine which in fact had very few Moldavians living there (this is the origin of the dispute between the modern Republic of Moldova and the self-styled Dniestr Republic, the largely Slavic-populated eastern region) and became the Moldavian SSR on 2 August 1940. From 1941 until 1944 Romania, allied to the Axis powers, once again ruled Bessarabia. Post war, the Soviets created a Moldavian language (largely accomplished by transcribing Romanian from the Latin alphabet into Cyrillic) and sought to encourage the creation of a separate Moldavian nation. This could not disguise the fact that the Moldavians are essentially Romanian, and although Moldova's initially expressed aspiration of union with Romania is now much more muted, the Moldovan flag is basically that of Romania with the addition of the national coat of arms on the yellow stripe. Romania/Moldova adopted a flag in the three colours during the revolutions of 1848 which drew inspiration (and vexillology) from the French revolution. Just to give a brief history. Bessarabia has long been a part of Principality of Moldova located between Carpathian mountains and the Dniestr. After the Ottoman invasion, Moldova lost its independence and became a sort of self-ruled province and its rulers (Gospodars) were appointed by Ottomans. Bessarabia became part of Russia according to the terms of peace treaty signed by Russia and Turkey in 1812. Autonomy was granted to Valakhia (Wallachia) and the rest of Moldova according to the Adrianopol Russian-Turkish treaty signed in 1829. In 1859 Valakhia and Moldova united as Principality of Romania which got formal independence in 1878 after another Russian-Turkish war when Romanians were Russian allies. Bessarabia went back to Romania in 1918, when Romania signed a separate treaty with Austro-Germans (in fact, there was no other choice for Romania). Soviet Russia and later USSR did not recognise this transition. In 1924 Moldovan autonomy within the Ukrainian SSR was proclaimed (now Transdniestr). Probably the Soviet authorities wished to use it as a core for a future "Soviet Romania". In 1940, USSR forced Romania to withdraw from Bessarabia which became Moldavian SSR. But some territories where Romanians (or Moldavians, actually it is a matter of self-determination of people of Moldova) had been minority were passed to Ukraine (South Bessarabia and Khotin). Simultaneously the largest part of Moldavian autonomy was transmitted to Moldavian SSR. In 1941, after the Nazi invasion, Romania took back Bessarabia, annexed Trandniestr and all Ukrainian territories between the Dniestr and the Bug (including Odessa). After the war, the borders of 1940 were restored. The current flag of Moldova was established in 1990 and symbolised both the Romanian origin and a wish for reunification (at the time most of non-communist Moldovan politicians wanted to reunite). But it is turned out that most part of Moldovan population do not support these aspirations. Now Moldova is a fully independent state and has no intentions to become part of Romania. In modern Romania the colors represent Moldavia, Transylvania and Wallachia. The colors of our flag only copy those of the Romanian flag as a symbol of common roots. http://www.batsweb.org/Cultura/Geografia/Geopolitica/eurasia.htm. The flag is a dark blue over red bicolour. The regulation on flag of Moldova was adopted on 27 April, 1990. This date is official birthday of the state flag. I was able to track down the Romanian version of the Constitution at the Moldovan President's website ("Simbolurile statului") and at the Moldovan Parliament's website and both say nothing about proportions. I did a little more digging and found the President's website has a page on the "State Flag of the Republic of Moldova" confirming the proportions at 1:2 complete with schematics. There's also a page on the "State Coat of Arms". According to the Romanian president's web site and Wikipedia, the reverse of the Moldovan flag does not have the arms. ...or one of those occasions (also - regrettably - not infrequent) where a Government body ignores its own legislation? Album des Pavillons (2000) reports this flag as the national flag on land and civil ensign. No mention is made of the state or war ensign usage. It is shown there as 2:3 ratio. According to "Flottes de Combat 2002", there is no Moldovan Navy. A larger version of this black and white construction sheet can be found here. The arms are placed on both sides on the flag (mirrored on the backside) and the construction sheet is very detailed, enough to precisely place the coat of arms on the flag. Also the colours are defined in various systems, including Pantone. M. Lupant, in his travel notes published in Vexillacta #10 (December 2000), reported two Moldavian flags he saw in the National History Museum of Chisinau. The first is a Romanian flag charged with a black aurochs head, which was used during the nationalist demonstrations of 1989/1990. The second is the Moldavian national flag which bears the signatures of the personalities who took part to the proclamation of the Republic (27 August 1991). Note that the flag is a 2:3 Romanian flag on which a yellow rectangle bearing the Moldavian arms was applied. The yellow rectangle of the arms is significantly darker than the yellow stripe of the flag. 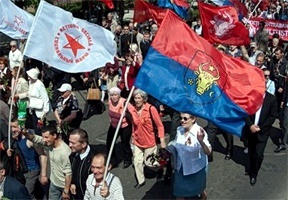 In the late 1980s (about 1989) nationalists in Moldova used many types of hand-made blue-yellow-red flags. Usually they had some kind of Moldavian coat of arms items in the centre. I saw flags with the ox head, a rose, crescent and star. The star was eight- or five-pointed. All figures were black or dark-brown. Moldova's pro-Russia President Igor Dodon has proposed a new flag for his country that would eliminate similarities the current banner has with the flag and coat of arms of neighboring Romania. Dodon said on February 2, Moldova's statehood day, that he wants lawmakers and civil society to discuss the idea and come up with legislative proposals "in the weeks or months ahead." Legal experts conclude that changing Moldova's national flag would require parliamentary legislation that is unlikely to be approved by the current ruling coalition. That [current] banner -- which Dodon claims is based on a flag from Moldovan history -- features a solid red background instead of the current blue, yellow, and red tricolor shared by both the Moldovan and Romanian flags. Historians say the tricolors of the current flags of Moldova and Romania reflect a common heritage dating back long before the late 19th century when the lands of present-day Moldova formed part of the Kingdom of Romania. Dodon's proposal also would remove the eagle from Moldova's flag -- a symbol that is similar on the coat of arms of both Moldova and Romania. Instead, the new design suggested by Dodon would retain the head of an ox, a star, a flower, and a crescent from Moldova's coat of arms. There are several projects of new national flags existed in Moldova from beg. of 2000s and used by different political wings. From what I have read (an Encyclopedia Americana flag article written by Whitney Smith) the coat of arms is an eagle holding a cross in its beak and an olive branch and sceptre in its claws. On top of the eagle is a shield "per fess" (split in half horizontally) red on top and blue below, with a stylized ox head over all between a rose and a crescent. The eagle is from the old Romanian coat of arms and ultimately from Byzantium; the ox head represents the old province of Bessarabia; the cross is obviously Christian; the sceptre and olive branch are probably for sovereignty and peace; as for the flower and crescent, I have no idea. Near the bison's head are situated, not a rose and a crescent. Why such strange design? Because, as I know, this is an astral symbol of the sun and the moon taken from Dacian coins (Daci were ancestors of the Moldovans and Romanians in ancient times). Also, the octagonal star above the bison's head is the Dacian symbol of wisdom. The three parts of the eagle's tail represent three part of the Republic of Moldova: Gagauzia (or Gagauz Eri as it calls itself) in the south, the central region as the biggest part, and the breakaway Dniestr region (Transnistria in Romanian or Pridnestrov'e in Russian). And if you compare our coat of arms and the Romanian coat of arms you can see that the Romanian eagle has a sword but our eagle has an olive branch (it's also a difference between the two nations). I have been led to believe that the bull-like emblem is actually that of an aurochs, a large beast of pre-historic descent that survived in the remoter regions of eastern Europe until the eighteenth century, before it was hunted to extinction. The story attributes the use of the aurochs head to the fact that the founding price of Moldavia (who I think was a noble possibly of Hungarian descent) encountered one of these beasts on his travels from the Mountains of northern Romania (either the Marmourous region or Bucovina) and that the animal attacked, killing the noble's wife who was thrown into the river Moldova, which subsequently became the Romanian name for the territory east of the Carpathian mountains. I am not sure if this legend is true, but the same scene is displayed in statue form in Sucevita in northern Romania. The law says: "The State Arms of the Moldavian Soviet Socialist Republic represents a horizontally cut shield, in the superior side has red chromatic, and in the inferior side – blue chromatic, a head of a ureox [aurochs] who has between the horns a star with eight rays. The head of the ureox is flanked in the right side by a rose with five petals, and in the left side by a contoured half-moon [crescent]. All elements represented in the shield are of gold (yellow). The shield is placed on the chest of a natural eagle carrying in the beak a gold cross (the eagle crusader [improper translation of "acvila cruciata", which means "crossed aquila", "aquila holding a cross") and holding in the right claw a green branch of olive, in the left a gold sceptre." The color of the aquila is unacceptable. It was meant to be a Roman aquila [...], so we should have had a golden one. It is the traditional color of the Roman aquila in Romanian heraldry. With certain reserves, a black (sable) aquila - the imperial symbol in Europe - would have been unacceptable too. This poor aquila cannot be natural, or brownish, as we have it, because this type of tincture has a special meaning. J.N. Manescu [Romanian heraldist] believes brown was adopted as follows: during the discussion regarding Vrabie's [Gheorghe Vrabie, author] and Mudrea's [Andrei Mudrea, author of another proposal] projects [of coat of arms] in the National Commission of Heraldry, Genealogy and Sigiliography of Romania, the problem of confounding colors of the aquila and yellow stripe of the flag arose. At this point, J.N. Manescu proposed a browner shade of gold for the aquila, distinguishable of the yellow stripe of the flag. The painter [Vrabie] most likely misunderstood the phrase and painted a dark brown aquila. Not only this didn't serve the purpose of having a Roman aquila, but natural colors are usually used for chanting arms - which would mean, for example, this could be the coat of arms of Aquila City - or for supporters, who have an auxiliary purpose. Thus, our aquila is a second-degree charge and therefore it can be replaced anytime with a different one. This is the worst heraldic mistake regarding the state coat of arms of Republic of Moldova, and it must be amended.